Article first published as Tabbouleh Salad on Blogcritics. Place cracked wheat in bowl and cover with 2 cups boiling water. Soak for 30 minutes; drain out excess water. 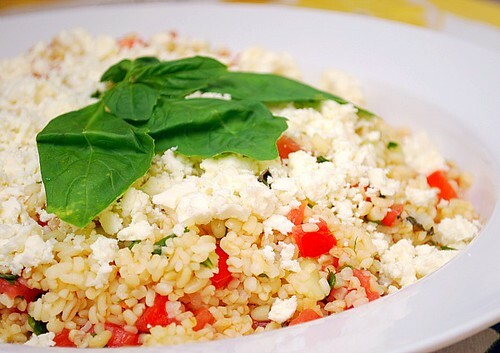 In a mixing bowl, combine the cracked wheat, tomatoes, cucumbers, onions, garlic, parsley, mint, salt, lemon juice, and olive oil. Toss and refrigerate for at least 4 hours before serving. Toss again prior to serving and top with crumbled feta cheese. I'm the one you are talking about who has never cooked with Bulgar. My wife has a sensitivity to cucumbers, so those are out... any suggestions??? You can certainly use zucchini in place of cucumbers.